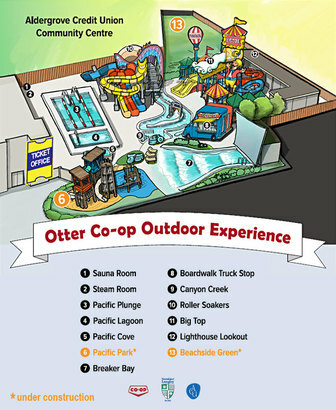 Located in Township of Langley’s Aldergrove Credit Union Community Centre, “Otter Co-op Outdoor Experience ” is a gigantic, year-round waterpark, which just opened in late June. To beat the heat, you and your family can enjoy it's interactive lazy river, a competition pool, a wave pool with six different types of waves and movie screen. It will also have a circus-themed aqua play structure, a hot tub that fits up to 50 people, and a picnic area.